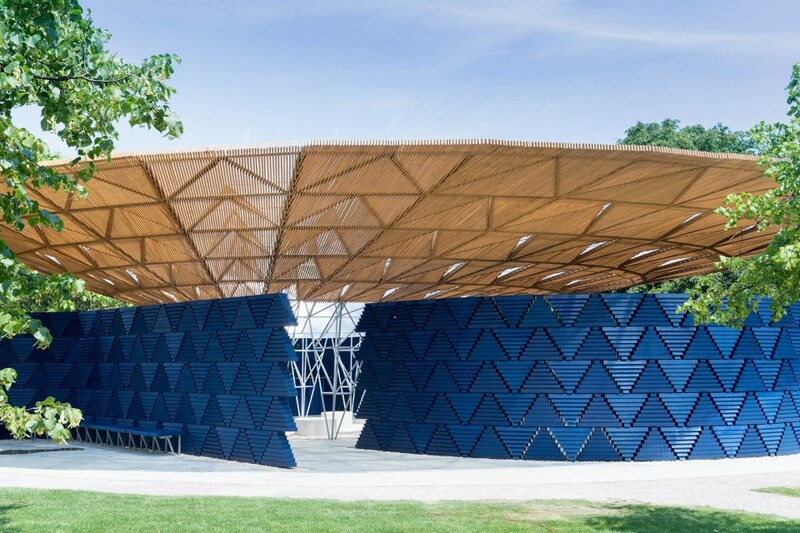 Kéré, who leads the Berlin-based practice Kéré Architecture, is the seventeenth architect to accept the Serpentine Galleries’ invitation to design a temporary Pavilion in its grounds. Since its launch in 2000, this annual commission of an international architect to build his or her first structure in London at the time of invitation is one of the most anticipated events in the global cultural calendar and a leading visitor attraction during London’s summer season. Serpentine Artistic Director Hans Ulrich Obrist and CEO Yana Peel made their selection of the architect, with advisors David Adjaye and Richard Rogers. Q. How did the idea of this project come to you? I wanted to put forward a strong idea that could potentially carry the weight of the legacy of past Pavilions. At the same time, I wanted to stay true to myself and introduce something fresh and perhaps unexpected. The idea for my Pavilion design came about quickly when I began thinking about the park as a gathering space, a space for recreation with the potential of creating a community-focused structure. Q. You masterfully combine local elements and materials with your personal history and roots. Can you tell us a little bit more about your village, Gando, in Burkina Faso? Gando is a remote place. It is not easily accessible, clean drinking water is difficult to source and when I was growing up, there were no schools. Being a child in Gando, the climate and environment played an important part in community and agricultural life. I saw how people struggled to build homes using clay, which during the rainy season would need constant repair. Experiencing and witnessing this inspired the way I work by using local, available and traditional building materials in a new modern way. Q. You mentioned the crucial role of women and locals in the creative process and the actual implementation of your projects in Burkina Faso. Do you think it might be a way to show a different aspect of Africa? Without women, there would be no Africa, the women are a powerful group, keeping society together by taking care of the family and being part of the community. If you notice how the women engage and work together to build a structure, you will see that Africa is a powerful continent where women are the driving force. Q. Speaking of which, a crucial element in your Pavilion this year was the tree, the place of gathering and encounter. Could you tell us more about it? The tree represents an important space in Burkina Faso under which the community and different generations gather. The weather is dry and very hot, with spells of rain. The need to keep cool and be protected against water in the rainy season is essential. As a result, I was inspired by the image of a tree in the landscape, which inspired my Pavilion design. The tree is about the canopy, which provides shelter and shade and protects against extreme weather. However, what is important is that a tree does not close you off from the outside world and environment. It is this idea of openness that I love and wanted to use in Kensington Gardens. Q. Is it necessary to encourage connections and exchange between people? Of course, it is important to have hope during these times, especially when people are divided by conflict. Today, it is even more vital to create structures that encourage understanding and connection. Q. Going back to your Pavilion, you skilfully designed your work playing with the light and the open space. Please explain your use of light and space? Light is fundamental, it gives the presence of energy. The playful interaction of light and shadow inside the Pavilion creates an atmosphere that is alive. When a cloud passes overhead or the sun begins to set, the shadows inside the Pavilion also move. The presence of light in my buildings is carefully studied and my architecture responds by protecting against too much direct sunlight and heat while also creating surfaces and openings for light to enter and reflect. This is how architecture becomes dynamic like nature. Q. Another important element of your work is the use of local materials and ecology. For the Pavilion you used wood, and designed the roof to gather and water the lawn. How did you combine ecology and local materials? The use of local and traditional materials is pure ecology. Reducing transportation costs also reduces the carbon footprint. Utilising local skills is also advantageous for the local community. Q. Your passion for storytelling inspired The Serpentine Galleries to host a series of night talks and events related to the subject of sharing and connecting. Could you tell us more about the role of storytelling, both in your experience, in your past and in your work? I was born into a culture where verbal communication is important. In Gando, more than half of the population have not had access to school education, and so storytelling and conversation is a fundamental tool for transmission. It has allowed us to share and discover the past. Storytelling is about creating connections and sharing knowledge. This cultural experience has helped me to communicate my ideas. Q. Tell us more about the creative process. How did you and the Serpentine bring this huge project to life? It was important to build upon the past experiences of the Serpentine who has commissioned many Pavilions. I gained an understanding of the landscape of the Pavilion site on the Serpentine lawn, constructing a building in one of the Royal Parks within the city, this was completely different to building in Gando in Burkina Faso. Working with the Serpentine Gallery gave me access to an existing network of engineers and fabricators such as AECOM and Stage One. It was a collaborative process and the drive and experience of the different teams was essential to the realisation of the Pavilion.